"Saturn X" redirects here. For the spurious moon reported in 1905, see Themis (hypothetical moon). Janus is named after the two-faced Roman god Janus. 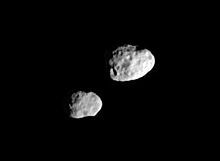 Although the name was informally proposed soon after the initial 1966 discovery, it was not officially adopted until 1983,[a] when Epimetheus was also named. The Oxford English Dictionary lists the adjectival form of the moon's name as Janian. Janus's orbit is co-orbital with that of Epimetheus. Janus's mean orbital radius from Saturn is, as of 2006 (as shown by green color in the adjacent picture), only 50 km less than that of Epimetheus, a distance smaller than either moon's mean radius. In accordance with Kepler's laws of planetary motion, the closer orbit is completed more quickly. Because of the small difference it is completed in only about 30 seconds less. Each day, the inner moon is an additional 0.25° farther around Saturn than the outer moon. As the inner moon catches up to the outer moon, their mutual gravitational attraction increases the inner moon's momentum and decreases that of the outer moon. This added momentum means that the inner moon's distance from Saturn and orbital period are increased, and the outer moon's are decreased. 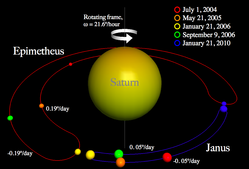 The timing and magnitude of the momentum exchange is such that the moons effectively swap orbits, never approaching closer than about 10,000 km. At each encounter Janus's orbital radius changes by ~20 km and Epimetheus's by ~80 km: Janus's orbit is less affected because it is four times as massive as Epimetheus. The exchange takes place close to every four years; the last close approaches occurred in January 2006, 2010 and 2014, and the next in 2018. This is the only such orbital configuration known in the Solar System. Janus is extensively cratered with several craters larger than 30 km, but has few linear features. Janus's surface appears to be older than Prometheus's but younger than Pandora's. Janus has a very low density and relatively high albedo, meaning that it is likely very icy and porous (a rubble pile). A faint dust ring is present around the region occupied by the orbits of Janus and Epimetheus, as revealed by images taken in forward-scattered light by the Cassini spacecraft in 2006. The ring has a radial extent of about 5000 km. Its source is particles blasted off their surfaces by meteoroid impacts, which then form a diffuse ring around their orbital paths. 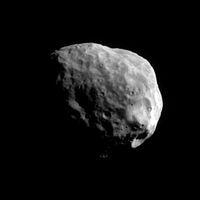 Along with Epimetheus, Janus maintains the sharp edge of the A Ring by a 7:6 orbital resonance. The effect is more obvious when the more massive Janus is on the resonant (inner) orbit. Janus as viewed by Voyager 2 (1981-08-25). Janus and Prometheus lie above and below Saturn's rings (2006-04-29). Janus and Tethys (foreground) near Saturn's rings (2015-10-27). Janus in front of Saturn as imaged by Cassini (2006-09-25). Janus as imaged by Cassini (2008-02-20). ^ a b El Moutamid et al 2015. Fountain, J. W.; Larson, S. M. (1978). 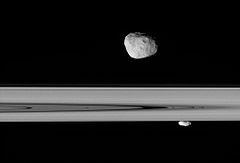 "Saturn's ring and nearby faint satellites". Icarus. 36 (1): 92–106. Bibcode:1978Icar...36...92F. doi:10.1016/0019-1035(78)90076-3. El Moutamid, M.; et al. (1 October 2015). "How Janus' Orbital Swap Affects the Edge of Saturn's A Ring?". Icarus. 279: 125–140. arXiv:1510.00434. Bibcode:2016Icar..279..125E. doi:10.1016/j.icarus.2015.10.025. Gingerich, Owen (January 3, 1967). "Probable New Satellite of Saturn" (discovery). IAU Circular. 1987. Retrieved 2011-12-28. Gingerich, Owen (January 6, 1967). "Possible New Satellite of Saturn". IAU Circular. 1991. Retrieved 2011-12-28. Gingerich, Owen (February 1, 1967). 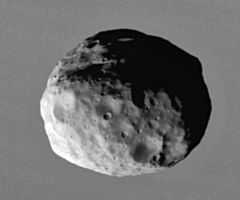 "Saturn X (Janus)" (naming Janus). IAU Circular. 1995. Retrieved 2011-12-28. "PIA08170: The Dancing Moons". Photojournal. JPL/NASA. 2006-03-05. Retrieved 2016-01-17. "PIA08328: Moon-Made Rings". Photojournal. JPL/NASA. 2006-10-11. Retrieved 2011-12-29. "NASA Finds Saturn's Moons May Be Creating New Rings". Cassini Solstice Mission. JPL/NASA. October 11, 2006. Archived from the original on February 12, 2012. Retrieved 2011-12-29. Marsden, Brian G. (October 25, 1979). "New Ring and Satellites of Saturn". IAU Circular. 3417. Retrieved 2011-12-29. Marsden, Brian G. (February 25, 1980). "Saturn". IAU Circular. 3454. Retrieved 2011-12-29. Marsden, Brian G. (February 29, 1980). "1980 S 2". IAU Circular. 3456. Retrieved 2011-12-29. 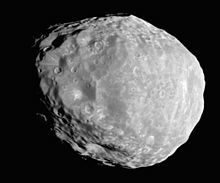 "Saturn: Moons: Janus". Solar System Exploration: Planets. NASA. 4 Apr 2011. Retrieved 2011-12-29. Murray, Carl D.; Dermott, Stanley F. (1999). Solar System Dynamics. Cambridge University Press. ISBN 978-0-521-57597-3.